Autovia was a short lived brand of British car from Coventry existing from 1935 to 1938 with production starting in January 1937. The venture was ambitious and even included setting up a school for chauffeurs. The cars were expensive and it was a market sector well served by other companies. 44 cars were made. 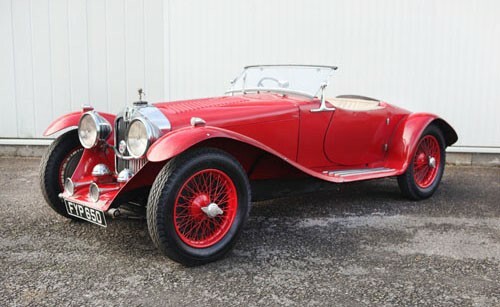 The company was created by Riley as a subsidiary to produce large luxury cars and a new factory was built. A 2849 cc 90°V-8, triple camshaft engine was developed from a pair of 1½-litre Riley engine blocks and coupled to either a conventional four speed manual gearbox or in a few cases a pre selector unit bought from Armstrong Siddeley. Drive was to the rear wheels through a live axle with worm gear final drive. Three body types were advertised, a Sports saloon, a Special Saloon with extra leg room at the expense of boot space and a limousine mostly built by Arthur Mulliner of Northampton who were London distributors. The car was also available as a bare chassis. The limousine was considered remarkable for its width being more than its overall height yet the floors were flat and a tunnel and wells avoided at the back. “The general low set helps stability” said The Times, “the models are well equipped, as they should be for the price”. Jump up^ Autovia Cars —Manufacturers of and dealers in and hirers of automobiles, motor vans, and lorries, &c.
Nominal capital, £60,000, in £1 shares. Jump up^ Sedgwick, M. (1989). A-Z of Cars of the 1930s. Devon, UK: Bay View Books. ISBN 1-870979-38-9. ^ Jump up to:a b c d e f Rileyrob. “Autovia (1937-38)”. Retrieved 2 February 2014. ^ Jump up to:a b c Culshaw; Horrobin (1974). Complete Catalogue of British Cars. London: Macmillan. ISBN 0-333-16689-2. Jump up^ Hardiman, Paul (February 2008). Duchene, Paul; Lombard, Stefan; Pickering, Jim, eds. “H&H Auctions, Duxford, UK: The Imperial War Museum”. Sports Car Market (Portland, OR USA: Automotive Investor Media Group). ISSN 1527-859X. Retrieved 2014-02-02. Intended as a rival to the likes of Rolls-Royce, Bentley and Alvis, Autovia Cars Ltd was founded in December 1935 with a start-up capital of £60,000. Helmed by Victor Riley of the famous car manufacturing dynasty, Charles Van Eugen and S. Gordon Marshall (the latter two acting as Chief Engineer and General Manager respectively), the new concern fielded a car which won its class at the 1936 Ramsgate Concours d’Elegance before going public during the following year’s Earls Court Motor Show. Available in bare chassis (£685), sports saloon (£975) or limousine (£995) guises, the Autovia range was powered by an advanced 2849cc OHV V8 engine boasting three camshafts, two Zenith carburettors and a Vertex Scintilla magneto. Credited with developing some 100bhp, it was allied to a choice of four-speed Armstrong Siddeley pre-selector or ZF manual transmissions and reputedly endowed the cars with a 92mph top speed. Supplied by Rubery Owen, the box-section Autovia chassis featured an underslung back axle (complete with David Brown worm final drive), Girling rod-operated drum brakes and Luvax adjustable shock absorbers. Showing signs of Bugatti influence, the front suspension utilised semi-elliptic springs whose leaves passed directly through a beam axle. Despite glowing reports in ‘The Motor’ and ‘Riley Record’ magazines praising the solidity, sure-footed handling and comfort of its products, the marque failed to make headway amid an already overcrowded marketplace. With total production thought to have accounted for just thirty-six cars, Autovia followed a beleaguered Riley into receivership on March 16th 1938. Bodied as a four-door Sports Saloon by Arthur Mulliner of Northampton and London, ‘GHX 1’ was first road registered on May 12th 1938 (or so an accompanying buff logbook would imply). Although, the first few years of its life are a mystery, the Autovia is known to have migrated from Middlesex to Staffordshire over the last seven decades. A source of confusion to various road tax licensing offices en route – London County Council labelling it as an ‘Autoria’ (1950) while Berkshire County Council settled on ‘Austin’ (1954) – the car was reportedly supplied to both its penultimate and current keepers by garagiste Arthur Saxty of Sunningdale Motors Ltd. A previous custodian himself, Saxty is rumoured to have only let ‘GHX 1’ go a second time in order to fund the purchase of a Duesenberg. Last issued with a MOT test certificate by Chiltern Autos Ltd on May 3rd 1962, the Autovia has been in the current ownership for the last forty-four years. Carefully dry stored for much of that time, it appears to have been very well preserved. The engine which is said to have been “running perfectly well” when the Autovia was taken off the road was later stripped down and inspected. Today, it contains clean oil and “turns easily on the starting handle” (though, the unit has not run for a long time due to concerns over the age of various seals and bearings etc). Although scruffy the black paintwork has done a good job of protecting the bodywork which seems substantially sound. While inside the beige leather upholstery, biscuit headlining and wood veneers all exude a wonderful patina. From the geometric patterns on its door cards to the delightful intricacy of its boot-hinge design, the Autovia is awash with charming details. Riding on nineteen-inch wire wheels, it sports Lucas supplied tri-bar headlights / spotlights / horns, twin Cornercroft ‘Ace’ spare wheel covers and a boot-mounted tool kit (incomplete). Displayed at the 1986 Coventry Riley Rally to celebrate Autovia’s fiftieth anniversary, the Sports Saloon has been written-up by the Riley Club and is known to the marque register. A potentially rewarding restoration project and a true Post Vintage Thoroughbred, ‘GHX 1’ is offered for sale with the aforementioned buff logbook and expired MOT certificate as well as an owner’s handbook, V5 registration document, starting handle and sundry paperwork. PLEASE NOTE: Since the catalogue went to press we have been contacted by Gordon Thomas of the Autovia Car Club who has kindly provided the following extra information “I would like you to know that as far as I am aware this is the only Special Saloon manufactured and it was displayed on the 1937 Motor Show stand. I think all the other saloons were tagged Sports. The distinction is that the Special saloon had more legroom, a smaller boot and a different contour round the back quarter. Also it was offered for the same price as the Limousine (995) rather than the lesser saloon price of 975. There were actually 44 cars made (I cannot tell you the split between Saloons and Limousines but I think it was heavily biased towards saloons). For a long time there was a theory that only 36 were manufactured but since I have been involved we have satisfied ourselves that there was a complete run from 63101 to 63144. The suspect empty run from 63113 to 63120 has now been populated with 4 cars (3,4,6 & 8) suggesting that there were no gaps in production. Of the production cars I can identify there were 29 saloons, 1 special saloon and 5 limousines. I have no definite record of the other 9 cars”.